String Quartet in d, D810 - "Death and the Maiden"
String Quartet in c, D703 - "Quartettsatz"
This double pack is a reissue of 2 earlier issues, and I wish space had been found for the dates, for the Lindsays have been with us a long time. And there my criticism of the discs must end, for here we have some of the greatest chamber music ever written played by one of the finest of all British quartets. What are the particular characteristics of the Lindsays' Schubert? It is powerfully dramatic, and always aware of the psychological neuroses which are never far below the music's surface. They are not perhaps especially concerned with surface beauty. 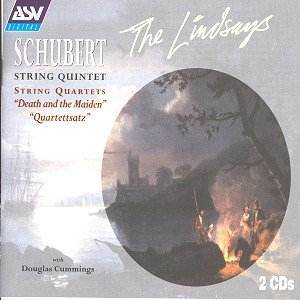 The few moments in the "Death and the Maiden" where Schubert moves to the major mode may have a more heart-easing quality in the hands of Vienna-based quartets but the Lindsay's troubled conception is all of a piece. In the Quintet they keep a just balance between lyricism and drama and nobody hearing their slow movement will have any doubt that this is one of the supreme things in all Western music. Their pacing of the last two movements so as to keep ever before us both their earthy roots and their private anguish is quite miraculous. There are other great recordings of this music, but this stands beside the best. A final comment. Chamber music never attracts the same public attention as orchestral or operatic music. If you have symphonies by Schubert and Bruckner but no chamber music, then go and get this. You'll never look back.